Last night I was at a pub (Savage’s Ale House to be exact) with some friends and we were talking about our various junk food vices. Doritos had taken the spotlight in our conversation being that they happened to be one a common vice. We’re all very aware that these delicious little triangles are not healthy for you but that wasn’t the point of our conversation. We were only concerned with the delicious factor. We were talking about the various ways we have consumed these delicious little triangles throughout our lives. We started with the old standard of putting chips on a sandwich to give it additional texture as well as a flavor component. I had mentioned that I wouldn’t be opposed to having a shaker full of Doritos crumbs on my table and that idea eventually progressed using a grinder and treating the chips like pepper. I thought the idea was hilarious and so the next morning I picked up a discount pepper grinder and made it happen. This picture originated as a text message to some of my friends that were at the pub the night before. I eventually put it up on both facebook and reddit but it has now gone viral. I am seeing my picture reposted everywhere. The majority of the reposts are not even crediting my website as the original source. 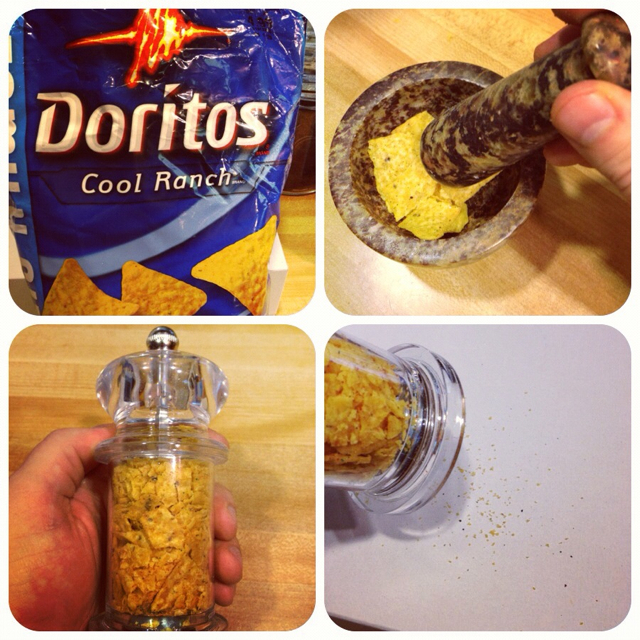 One last thing… For all of you health nuts that think I am actually putting Doritos Dust on everything that I eat. I am not obese. I am not an unhealthy person. I’m pretty good when it comes to enjoying junk food in moderation. For the most part I maintain a fairly healthy diet with a few guilty pleasures thrown in every now and then as a means to keep me sane. That being said, when it comes to guilty pleasures Doritos are at the top of my list.